The theme of ASCL's annual conference - leading teams - applies to leaders and managers at all levels in schools and colleges. Terry Allcott looks at leadership styles that help to build successful teams. Studies have shown that some of the most effective examples of organisational leadership have been found in schools and colleges. The sheer variety of tasks and expertise required of education leaders, and the impact they have on their institutions, is much greater than in other professions. We also know that, increasingly, successful schools and colleges require effective teams. And leading successful teams is about building relationships which take into account not just the skills and expertise of team members, but why individuals act as they do and how this affects the way they work. It is also clear that a leader's or manager's impact is greater still when he or she has a deep understanding of his or her own preferred way of working and interacting with others, both in the team and throughout the organisation. We know that individuals, like students, have preferred ways of working and learning and that the best teams most often are made up, almost accidentally, of people with different strengths. We know that the person with lots of ideas is most effective working with someone who is good at getting things done. The person who is keen to get stuck in and get on with the job also needs someone with an eye to method and detail to make best use of their collective skills. Good leaders will take this into account when making appointments and setting up working groups. Heads who have been through the Leadership Programme for Serving Headteachers (now Head for the Future) will be familiar with research from the Hay Group that identifies six leadership styles and relates them to education leadership. Recognising that different leadership styles are needed day to day and in different situations is fairly clear. What may be murkier is where these styles come from and how best to adapt them to motivate a team and to get the best from all team members, each of whom, of course, will have his or her own preferred style of working. It may be tempting to say that one style is better than another but, in fact, a mix of all of them is required for managing successful teams. The coercive style is where immediate impact is required: "I need this done and I need it immediately." Clearly there is no room for lengthy discussion. It doesn't need to be an aggressive demand to be coercive, but it does need compliance, usually without debate. An obvious positive example would be a fire alarm or other emergency where things need to be done instantly. A negative example would be where a leader is simply exercising power for ulterior reasons. Power doesn't need to be negative and in exercising the authoritative style, a leader is showing his or her ability to set standards and clear ways of working and articulate the vision of the organisation. Where a leader demonstrates this style, other staff know where they stand and where they fit in the overall plan. If used with other styles, this is unlikely to have a negative effect, but used on its own the leader can sometimes appear a bit aloof and out of touch. Most school and college leaders are 'people people'. They went into education because they want to work closely with others and impact students' lives. Therefore personal relationships are very important. Leaders who like to work closely and build harmonious relationships with their colleagues often use the affiliative style. The advantage is that this style tends to build great loyalty and makes for a happy environment. However, when used exclusively, it can then become extremely difficult to make the hard decisions about performance and discipline. Many school and college leaders tend to believe that major issues should be consulted upon. Taken to an extreme, they sometimes believe that every part of the operation needs to be discussed. The advantage of using this democratic style is that once consensus is agreed you have a unified staff. The downside is that lengthy discussion is not always practical. 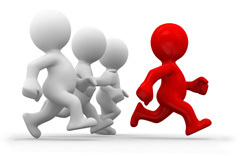 Interestingly, evidence shows that the next style, pacesetting, is not often employed by school leaders in particular. It could be described as 'leading from the front'. It embodies a belief that you are the only person who can do it right. Occasionally when schools or colleges are coasting or in difficulty, this may be the appropriate style. Used for too long it can lead to burn out. The last style identified by Hay is the coaching style. This is where a leader gets alongside staff members and helps them develop particular skills and expertise. It has a very good impact when used as a short- or medium-term approach, but the danger long term is that it is not sustainable and can develop a dependency culture. Research has found that the best leaders intuitively use a 'tool box' of styles where they move fluidly from one style to the next, picking the appropriate style for the particular situation. Once they become conscious of how these work, leaders can begin to learn how to use the tool box more widely. One good exercise is to think about a situation or a project when you felt you were at your best as a leader. Analyse what happened, who were the other 'characters' involved, what your desired outcomes were and what actually happened. Then look at the leadership styles which were employed during that time. Invariably you will see that you were using a variety and using them appropriately. Next, take another example when things went 'pear-shaped' or the outcome was less than satisfactory and you will tend to find that you used only one or two styles, and then possibly the wrong ones. There is a good reason for this and it takes me back to the issue I raised at the beginning about preferred styles and preferred ways of working. If you look again at the brief descriptions of the styles above, you will find one or more that you feel fits with your view of how you tend to work. Evidence shows that the style you use when under pressure or in a stressful situation is the style you tend to fall back on. If you suddenly find yourself instructing somebody to do something when you know that isn't the best way of resolving the situation, it's because your dominant style is the coercive one. If, when conflict arises, you find yourself backing off and trying to avoid an argument it is likely that your dominant style is affiliative. The key to managing successful teams is to know about all the styles, and how they impact upon others and the organisation, and to learn how to manage them. The issue of preferred leadership styles applies to all members of a team. The most effective teams will be those where, collectively, they have the ability to use a wide variety of styles in the appropriate way. The team members will know their strengths and areas for development and will operate accordingly. Just as importantly they will understand that other members of staff will have their own styles and ways of working and take this into account. Recognising these ways of preferred working is also part of developing emerging leaders. Developing leadership potential in staff means looking at the 'whys' as well as the 'hows' of the way they work with their colleagues. Hay's research also looks at how we become more comfortable with particular styles and how to recognise the preferred styles of others. It looks at how the things we value have an impact upon our day-to-day behaviour and the way in which we interact with others. Once you understand that and can use that information as a management tool, you will undoubtedly be a better leader. Terry Allcott is the ASCL MAPS director. He has also been an LPSH facilitator.